Browse: Home / Is it innovation or just an improvement? Does it matter? Interesting (and heated) discussions @ Unleashing Innovation Summit in Amsterdam earlier in the month: Incremental innovation is NOT innovation – it’s just marketing. REAL innovation is breakthrough/transformational… Agree or not? I’ve seen this debate before. Attempts to finally, once-and-for-all establish just where improvement ends and innovation begins. People end up with a Maginot Line that fails to defend the sanctity of innovation. Quick: Amazon 1-click purchasing…improvement or innovation? Does it matter that we define innovation? I once collected a bunch of people’s definitions of innovation to celebrate the multiple ways people think about it. That was a nod to the different ways people think about it. It was divergence, not convergence. 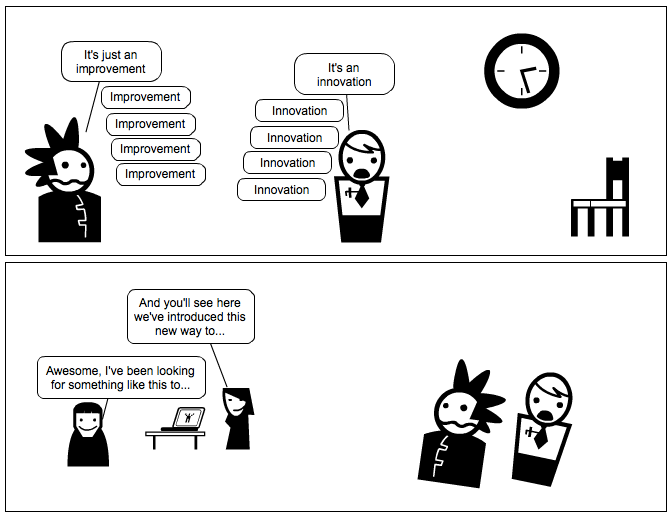 But there are times people want a clearer line between innovation and improvement. Let’s see how some smart folks have articulated the difference. What if we actually settled this debate once and for all? Assume for a moment that we, as a society, agree on what constitutes Innovation. Then what? What is the logical flow of events and decisions that follow such a conclusion? The reality it that doesn’t matter what something is called ex post facto. It only matters what impact it has on the consumers of the improvation. Here, it is important to understand how you define what you’re seeking. And it doesn’t matter whether you call it an improvement or an innovation. Afterwards, after the idea has become real? Again, it doesn’t matter what anyone calls it. It’s about how well it addresses the job-to-be-done. Call it what you want.